Henrik Stenson has a three-stroke lead over American Jordan Spieth after a rain-hit second round of the Tour Championship in Atlanta. The Swede, 39, shot a steady two-under 68 to record a sixth straight round under par at the East Lake course. 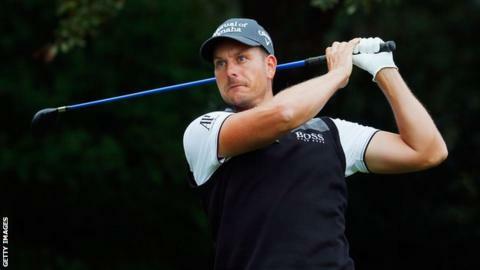 Stenson is one of five players for whom victory would mean he would win the FedEx Cup, and with it a £6.6m bonus. Masters and US Open champion Spieth is another, and his 66 was the best score of the day. World number one Jason Day is also in contention for the FedEx Cup and is one-over after a level-par second round. Making up the quintet are American's Rickie Fowler (one under) and Bubba Watson (one over), who shot rounds of 69 and 71 respectively. Englishman Paul Casey is handily placed in third on five-under after a level-par round, while Northern Ireland's Rory McIlroy is tied fifth on three-under after a 71. Former US Open winner Justin Rose remains in contention after a 68 left him two under.